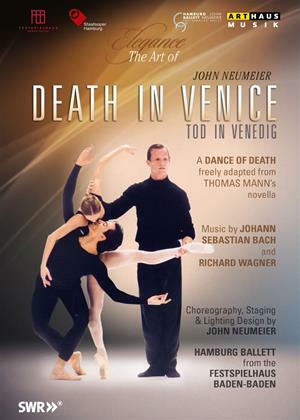 John Neumeiers free adaptation of Thomas Manns novella Death in Venice for the marvellous dancers of the Hamburg Ballett walks a fine line between astute theatricality and melodrama, between brilliant passages of movement and banal gestures. The primary message is that the life of an artist - even a famous, successful one - can be hell unless hes in creative touch with his inner child, his emotions. In a sense, my ballet is a love story with life. What fascinates me in Thomas Manns text is his depiction of absolute love. In my ballet, von Aschenbach is a master choreographer. Tadzio, however, causes the artist to confront a neglected aspect of his humanity. Resisting at first his emotional reaction to the boy, he seeks a purely artistic justification for his obsession. But, eventually he will surrender, turning from art to life and ultimately to death in Venice.